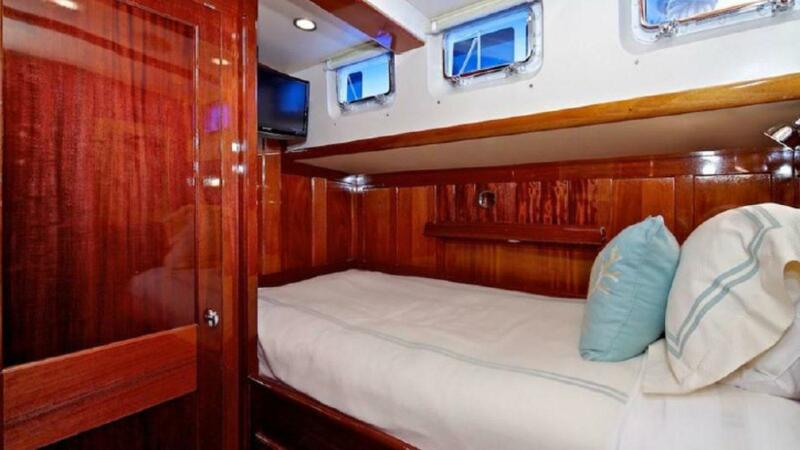 Starting forward is the crew quarters with upper and lower berth. 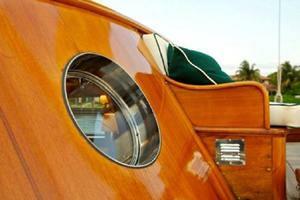 This cabin has opening portholes with safety covers. Built in to the locker forward is a Miele washing machine and dryer. 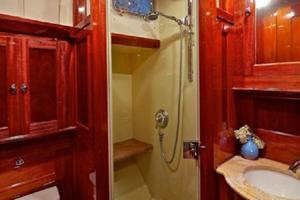 To port is a head with toilet, washbasin, and shower. 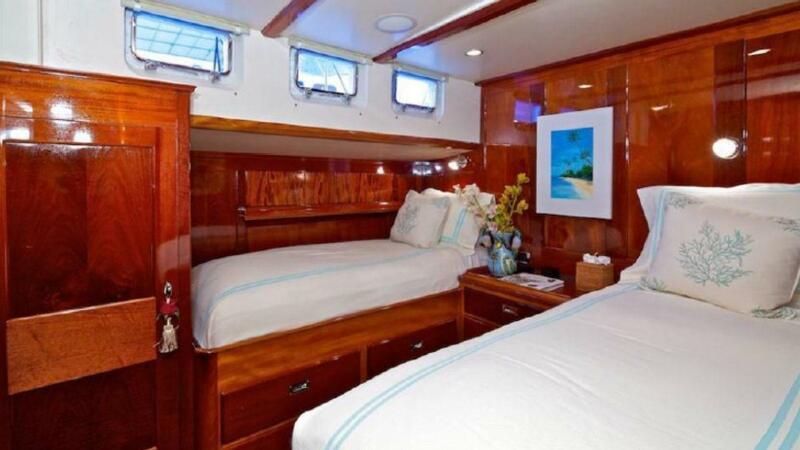 Port aft is a captain’s cabin with double sized berth and opening portholes. 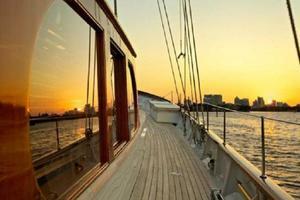 The galley is aft to starboard. There is a small passageway forward. 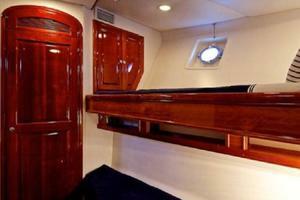 In this passageway is a stainless steel and teak ladder up to the crew scuttle. 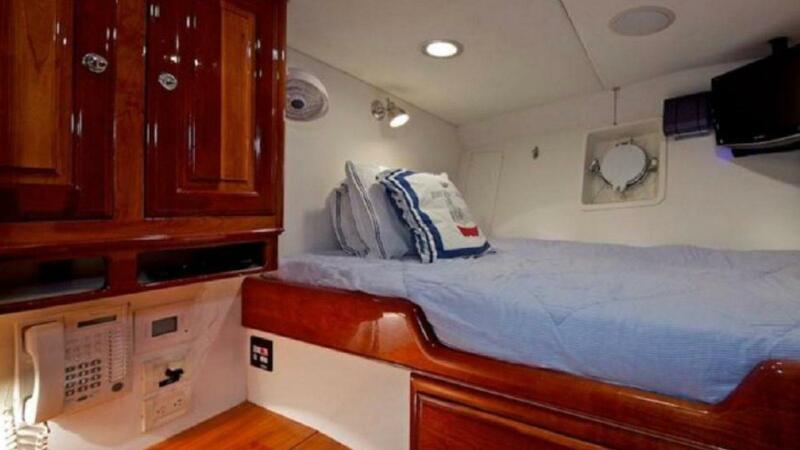 In the passageway is seen an ICOM model #M405 VHF radio and a fire blanket. 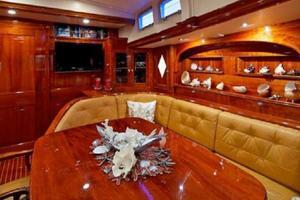 The main salon and dining area are on the lower level. 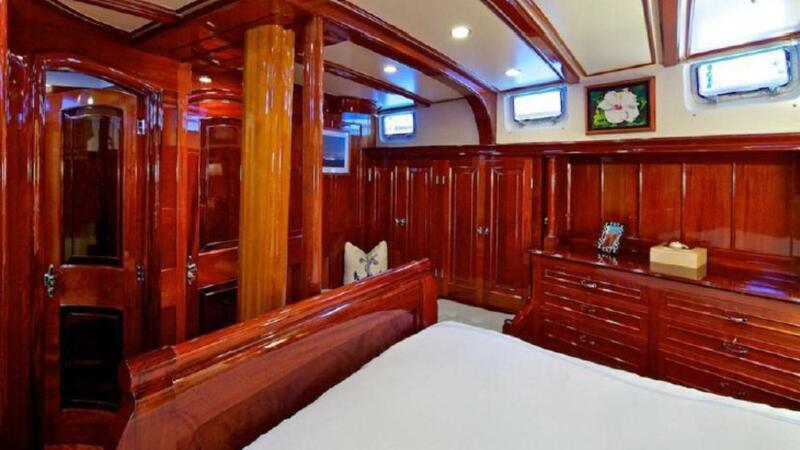 There are three deck hatches, portholes across the front, and portholes in the cabin sides. 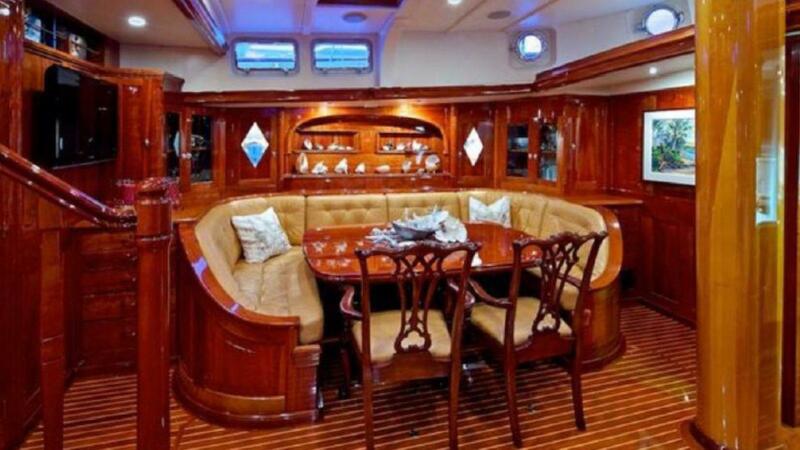 There is a large circular settee to port with dining table and two loose chairs. 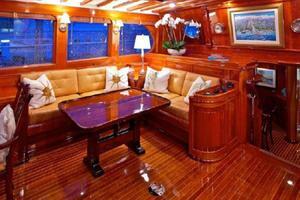 To starboard is a smaller settee with tables. 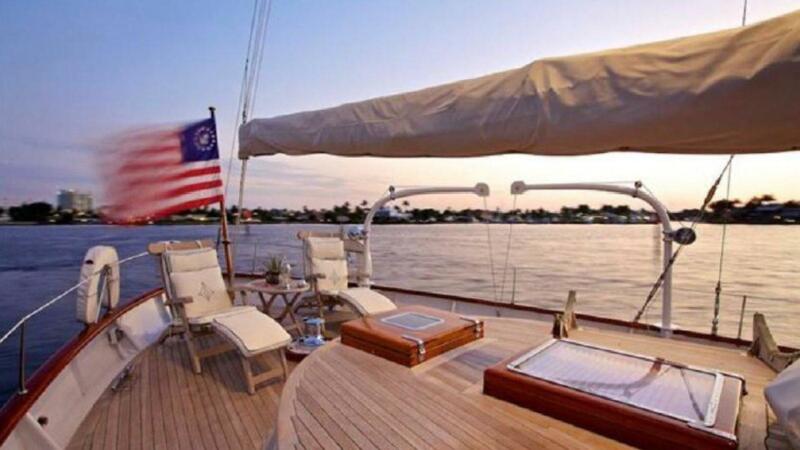 Starboard aft is a day head. Alongside is a marble top with sink. Aft are stairs to the upper salon. 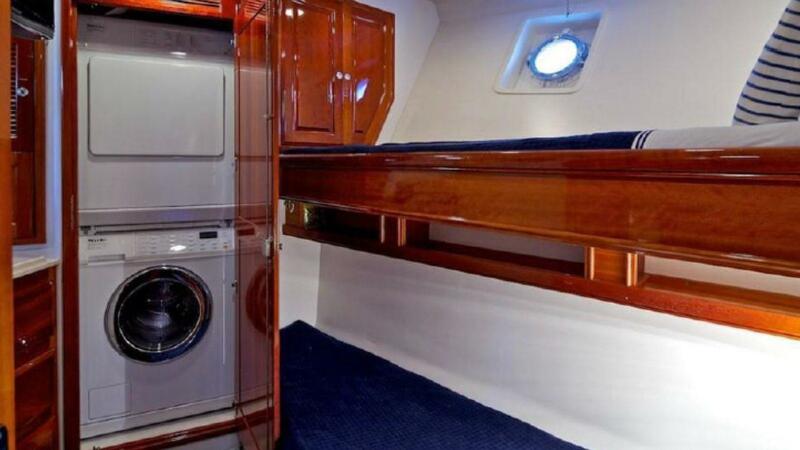 Centerline aft is a sound door which reveals a watertight door to the engine room. The upper salon is up approximately 5 steps and has large fixed windows and portholes. 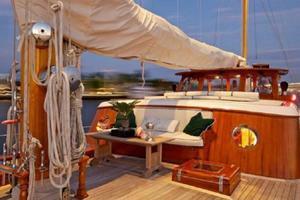 To port is a built­in settee with table. 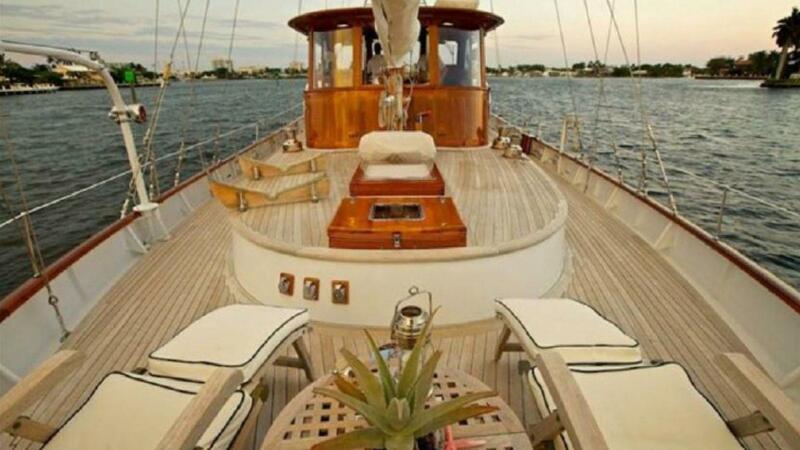 To starboard is a small settee. 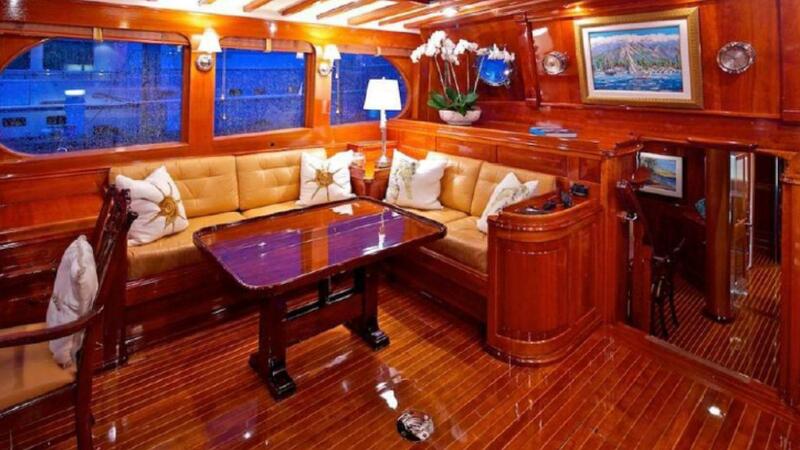 Port aft is a desk. Built into the desk is a Panasonic TV on a list. There are soft patches in the deck and overhead for engine removal. Forward are the stairs down to the main salon. 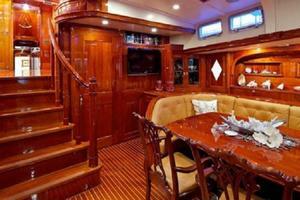 Aft are stairs up to the wheelhouse and stairs down to the guest accommodations. 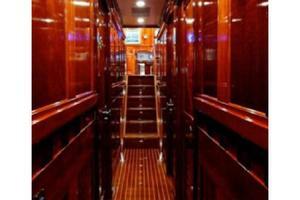 In the aft lower passageway is a cabinet. 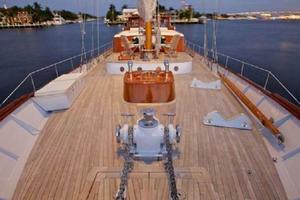 In here are the centerboard winch controls and winch. The winch is fitted with a 7 x 19 stainless steel cable. 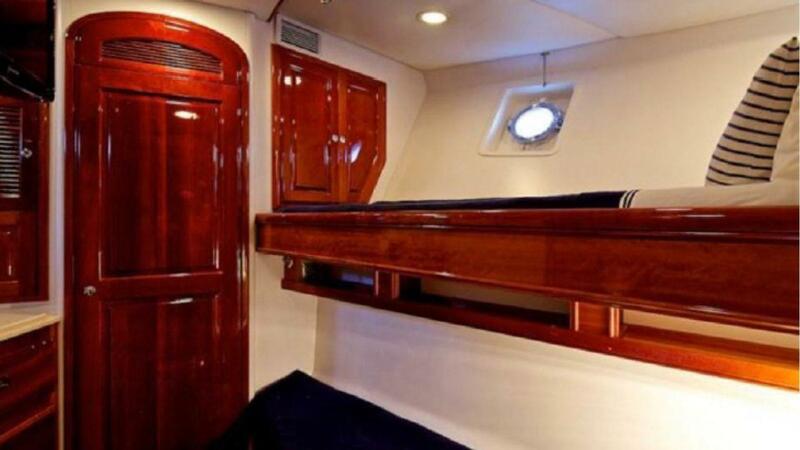 Aft of this cabinet and down lower is a removable locking pin for the centerboard. 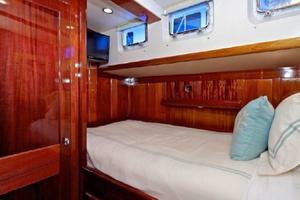 To starboard off the passageway is a guest stateroom with double size berth and opening portholes. There is a door aft of the head with a second door to the passageway. 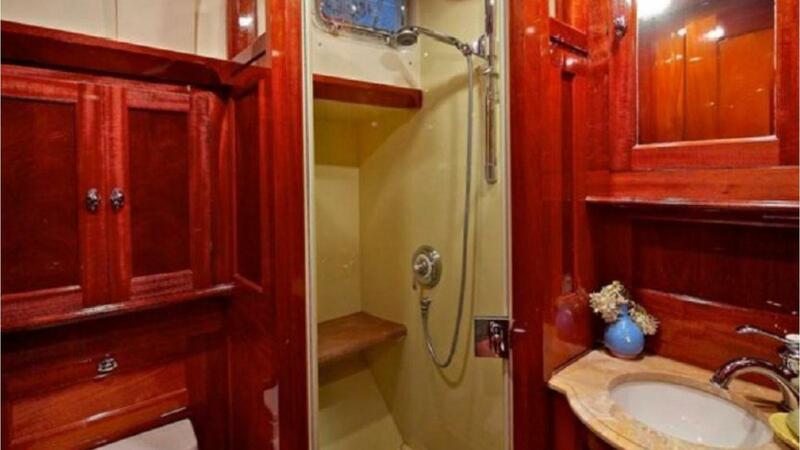 The head has a toilet, washbasin, and enclosed shower. 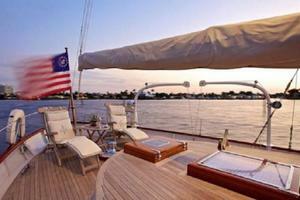 To port is a guest stateroom with two lower berths and a porthole. Low in the locker is the Koopnautic main control panel. 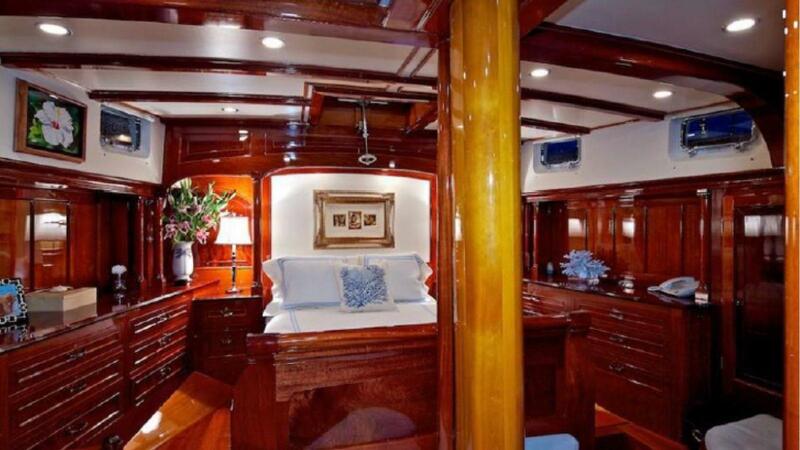 This stateroom shares the head across the passageway. 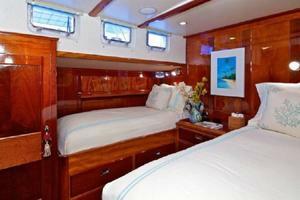 The master stateroom is aft. It is full beam with opening portholes. 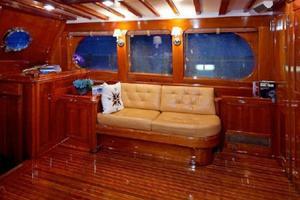 There is a centerline queen, two settees and deck hatches. In here is seen a multifunction phone. 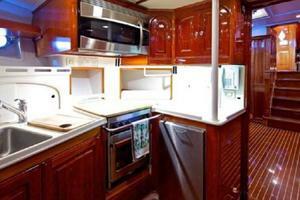 There is a private head with toilet, washbasin, and enclosed shower. 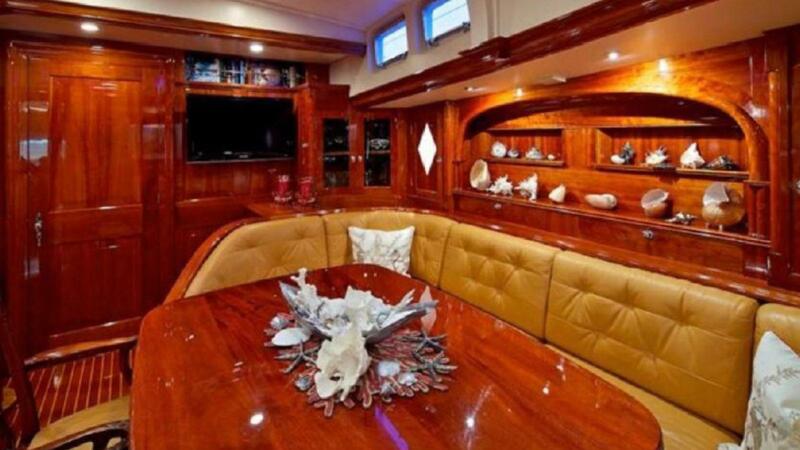 SEA DIAMOND is a single station vessel with all of her main electronics, navigation, monitoring, and communication equipment located in the wheelhouse. The engine room is accessed via a quick acting dogged and gasketed hinged door with round viewing port. 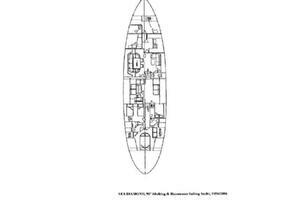 Secondary access is via the emergency escape into the starboard side of the upper salon. A removable ladder is provided at the forward bulkhead engine room access. 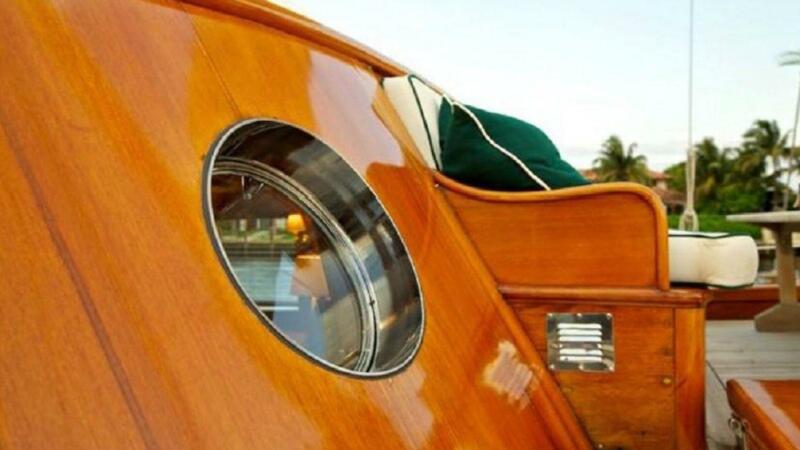 The forward engine room access door is on centerline aft through a lockable varnished wood finished door from the lower salon. The engine room is well lit with AC fluorescent and DC overhead spotlighting. This space is insulated behind painted perforated sheathing. The deck plates are single knocked aluminum panels with a painted finish secured with stainless steel machine screws on painted steel frames. 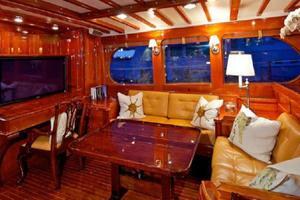 The engine room is fit with four deadlights with covers. 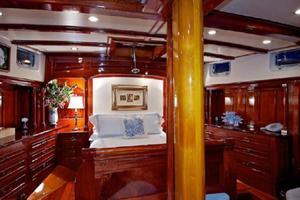 Engine room ventilation is provided via inline axial flow AC electric ducted supply and discharge blowers located port and starboard. 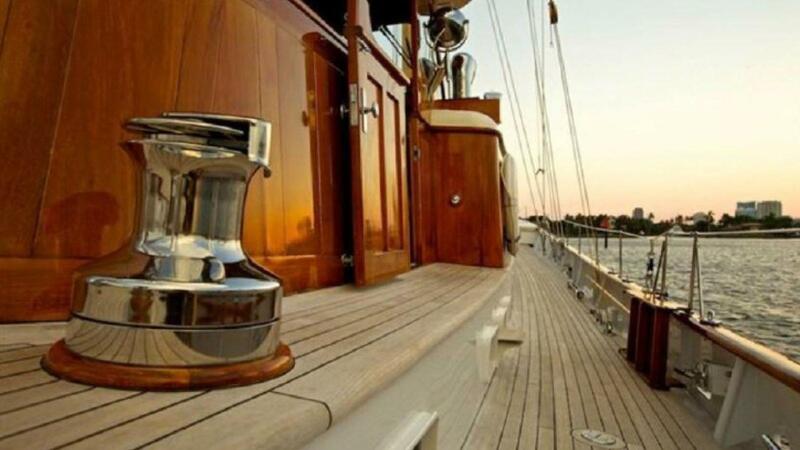 Port ventilation is exhaust; starboard is intake. Engine room fire suppression is via an automatic/manual Fireboy extinguisher FM200. A CO2 portable fire extinguisher is mounted forward. Aft is mounted a 1.5 gallon AFFF portable fire extinguisher. Bilge pumping is by three submersible DC electric bilge pumps, main engine belt driven Jabsco impeller pump with manual clutch, and by the central bilge pumping system pickup with AC electric pump. 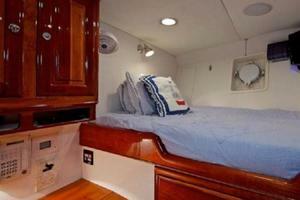 The bilges are monitored via pump mounted 2­stage float switches. There is a mechanic’s toolbox with various hand tools and a 6” cast iron vise. 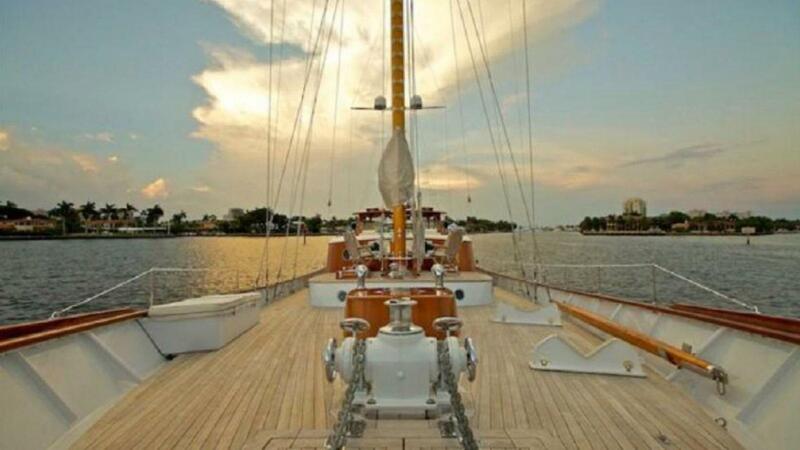 To port, mounted about the watermaker, is a StarBoard work surface. 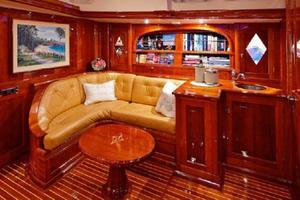 The engine room is well kept and well maintained. 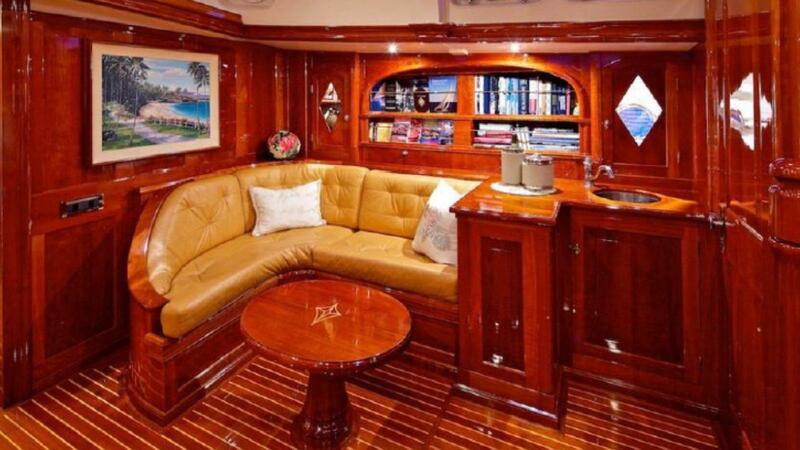 It is apparent that the engine room has been recently refit. 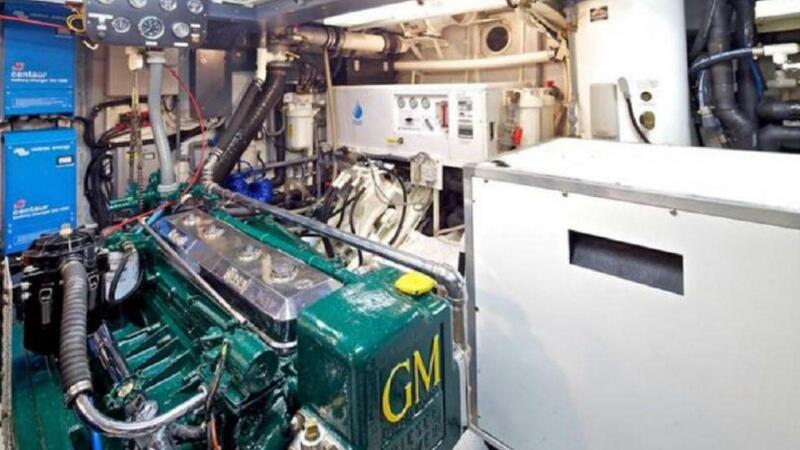 SEA DIAMOND is powered by a pair of GM Detroit Diesel 6V71N naturally aspirated freshwater cooled 2­stroke diesel main engines built on remanufactured long blocks. 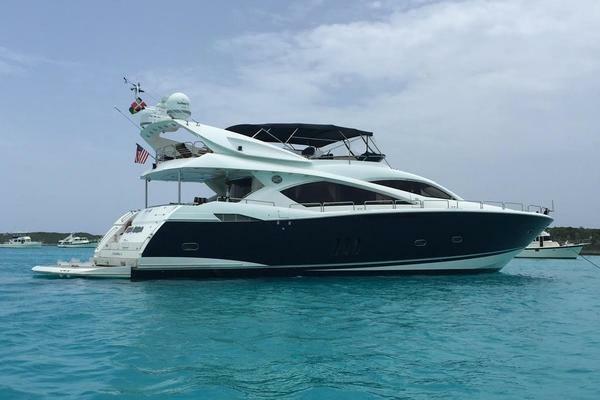 The main engines are rated for a reported 210­hp at 2100 RPM. 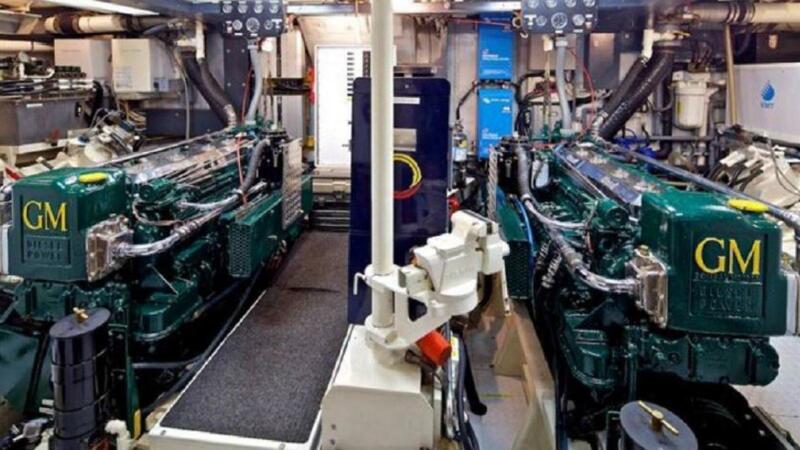 The main engines are close coupled to Allison Marine reversing gears. There are no data plates on the reversing gears; however, documentation onboard indicates the final drive ratio of 2.05:1. 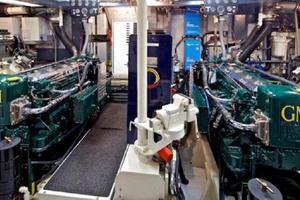 The main engines are single isolation mounted on the main longitudinal in the engine room. There are Kobelt hydraulic disc shaft brakes actuated by reversing gear clutch pressure. The output shafts pass through the aft bulkhead of the engine room and are sealed by a packing gland. Shafts run in pillow block type greased bearings and exit via steel stern tubes with Tides Marine type Strong dripless seals. Each main engine is fit with a Parker Racor main engine crankcase recovery system. The main engines are 24­volt DC start off dedicated battery banks. The battery banks are maintained by engine belt driven alternators or by dedicated 12volt DC battery charger located in the engine room. The port main engine PTO drives the stabilizer hydraulic pump. 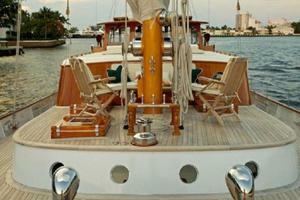 The starboard main engine belt drives a Lestek 24­volt DC 240 amp alternator for the house battery bank system. Each main engine and reversing gear is plumbed with an oil change system quick connect. 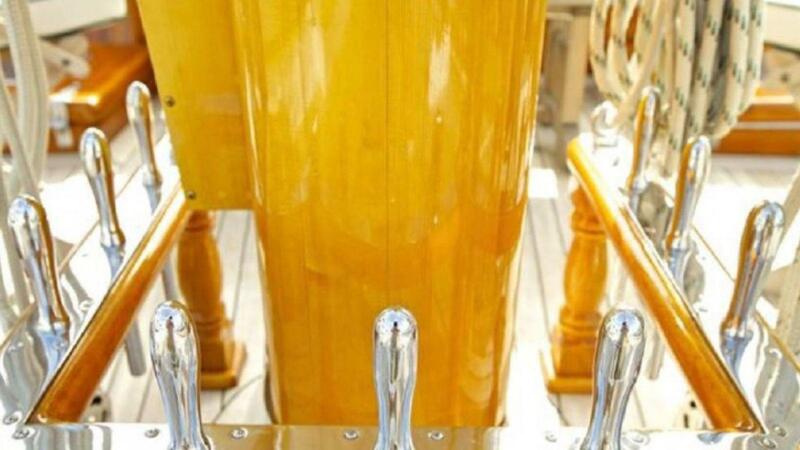 The main engine exhausts are dry stainless steel risers with hard coat insulation to water lift stainless steel mufflers with discharge out the transom. The exhaust connections are black exhaust rubber hose and fiberglass extension pipes with stainless steel hose clamps. 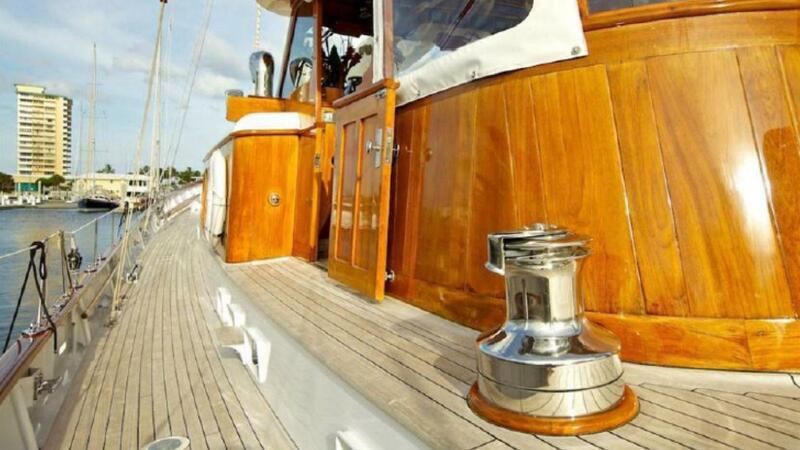 The starboard main engine belt drives a manually clutched Jabsco impeller type emergency bilge pump with cross connect to the main bilge system. The main engine controls are Morse single lever with chain and cable arrangement. The main engines are each protected by a single Racor model #1000 fuel filter water separator with pressure/vacuum gauges. 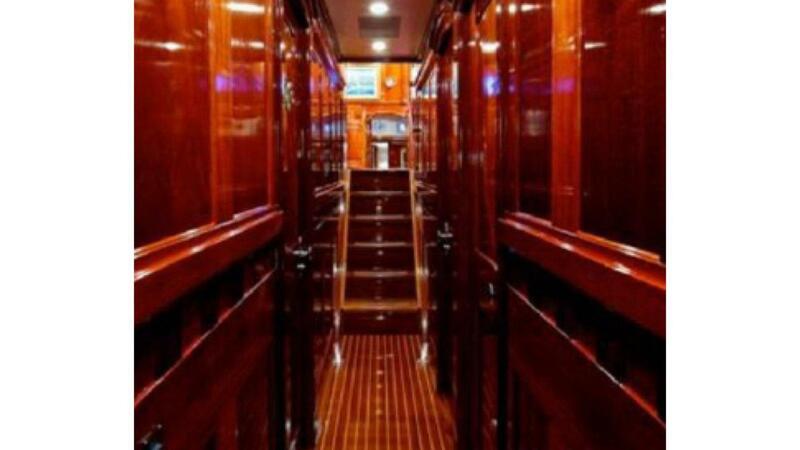 The main engines have local start/stop panels located in the engine room with bridge start disable and Murphy switch gauge package with alarms for main engine oil pressure, jacket water temperature, gearbox oil pressure, amps, tachometer, hours and raw water pump suction vacuum. SEA DIAMOND is fit with a pair of Northern Lights naturally aspirated diesel electric generators single isolation mounted inside full factory sound shields. Each generator is 12­volt DC start off dedicated 12­volt DC batteries located adjacent to each generator. The generators belt drive 12­volt DC alternators. 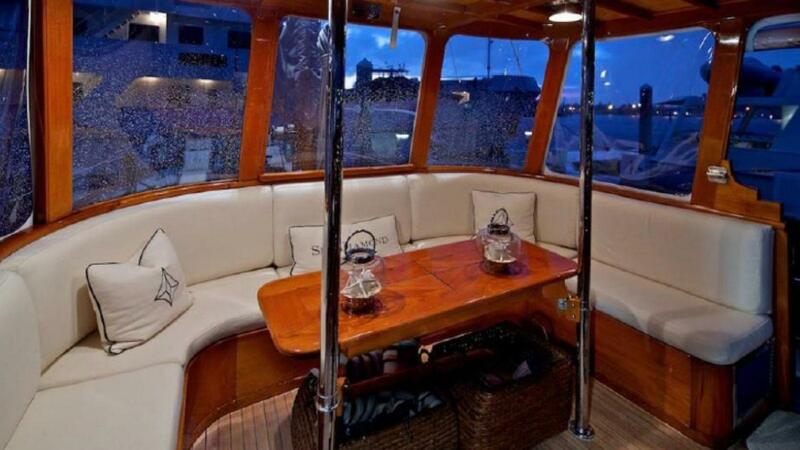 The exhaust is dry hard coat insulated to stainless steel water lift type mufflers with discharge out the transom. Generator exhaust connections are hose with fiberglass pipe extensions and inline fiberglass mufflers. 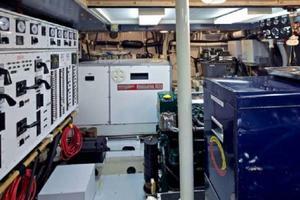 Each generator is plumbed with an oil change system quick connect fitting. 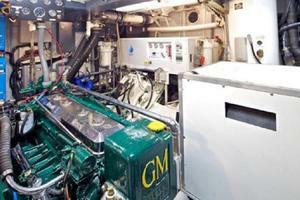 The generator fuel systems are serviced by Racor 500 fuel filter water separators. 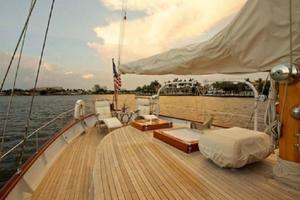 The port generator PTO drives the bow thruster system hydraulic pump with electric clutch selectable at the helm. Each generator is fitted with a Northern Lights model #S­3C gauge panel with local start/stop preheat and analog gauge package for jacket water temperature, oil pressure, volts, and hours. The generators are rated for 32­kW, 32­kva, 60­hz, 1800 RPM, single phase, 240/120­volt AC, 133/267­amps. 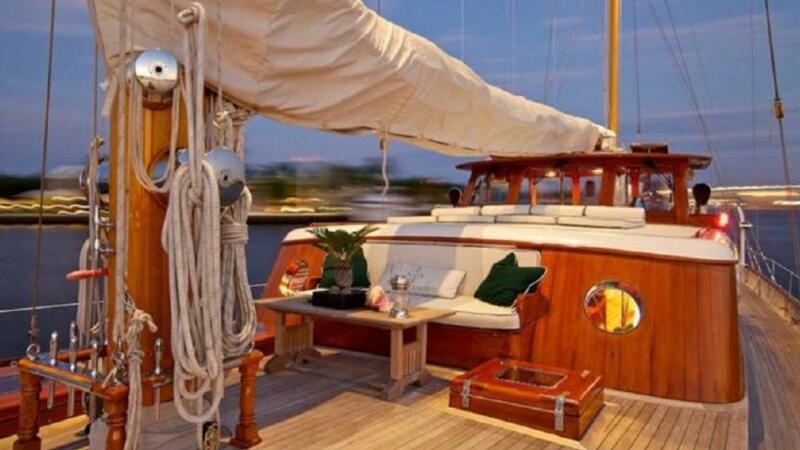 SEA DIAMOND has full teak decks with low open bulwarks, on top of which are well fitted heavy teak caps. On top of the caps are single vinyl covered stainless steel lifelines on stainless steel stanchions. 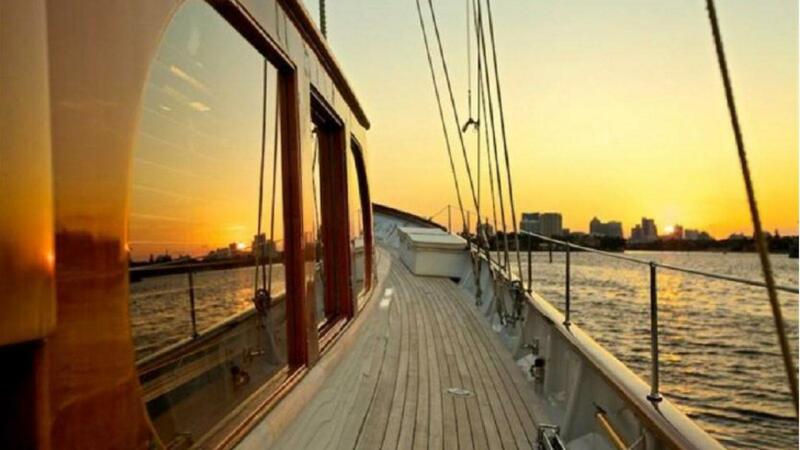 There are gates port and starboard. 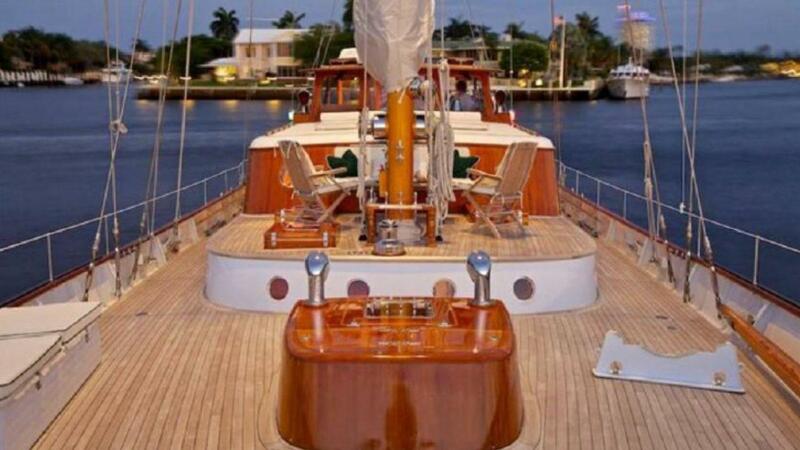 Her teak decks are well fitted. 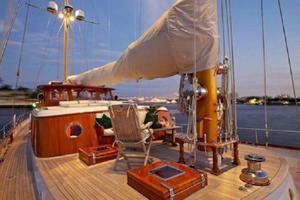 The teak decks are built with waterways. 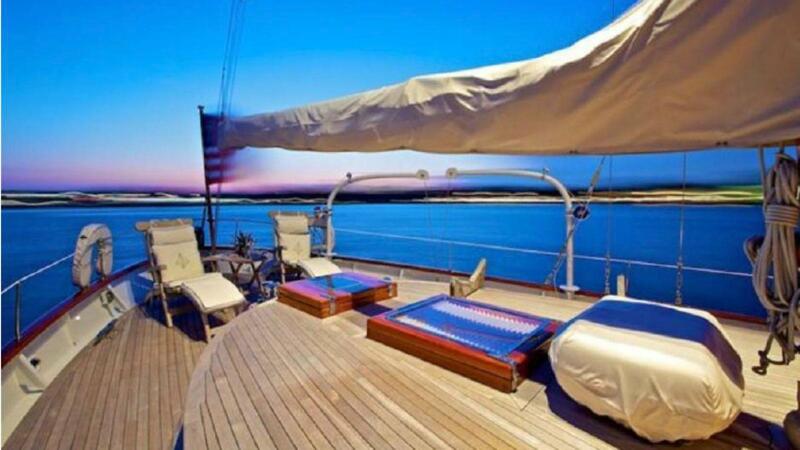 The decks are blind fastened. 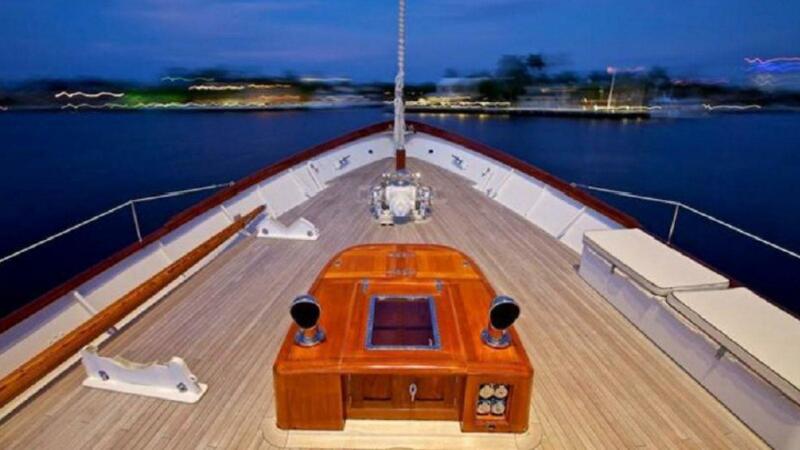 The decks are in excellent condition. In the stem is a Sampson post. 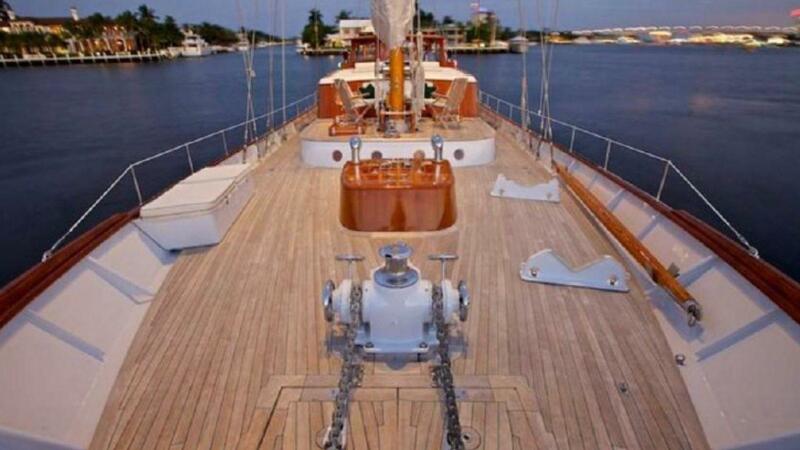 Centerline on the deck forward is a horizontal Ideal electric windlass with two gypsies and a capstan. There is a 5/8 chain on each gypsy of undetermined length. The chains are fitted with chain stoppers and devil’s claws. 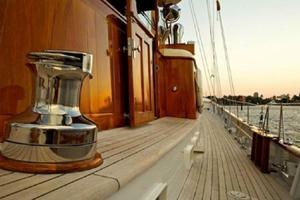 Forward of the windlass is a double hatch into the chain locker. 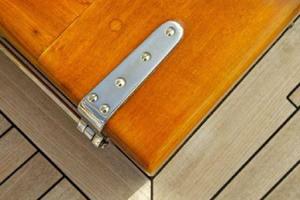 On deck to starboard is an aluminum deck box. Inside is a stainless steel propane locker with two bottles and remote shutoff. 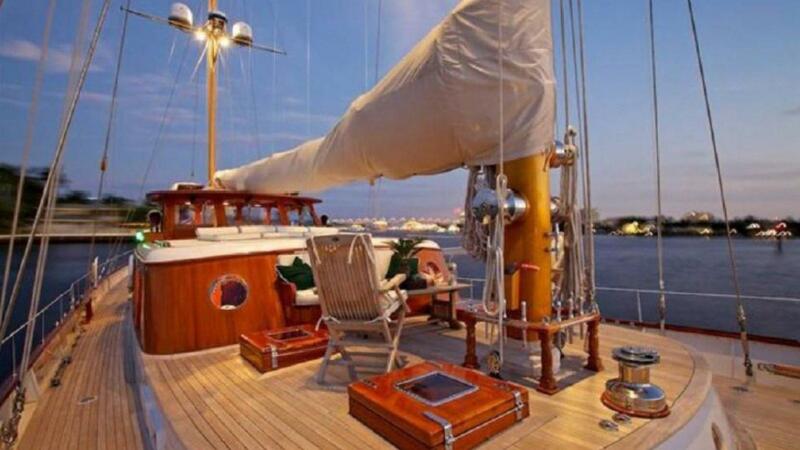 Mounted on deck to port is a whisker pole. 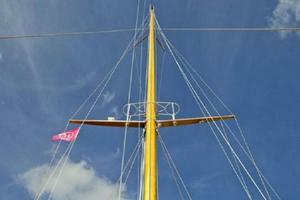 On the forward housetop around the mast step is a pin rail with stainless steel pins. 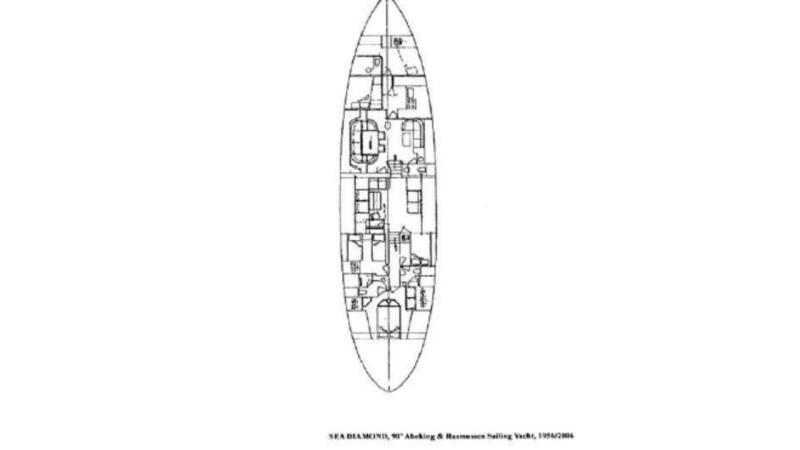 On the forward housetop are three opening deck hatches. 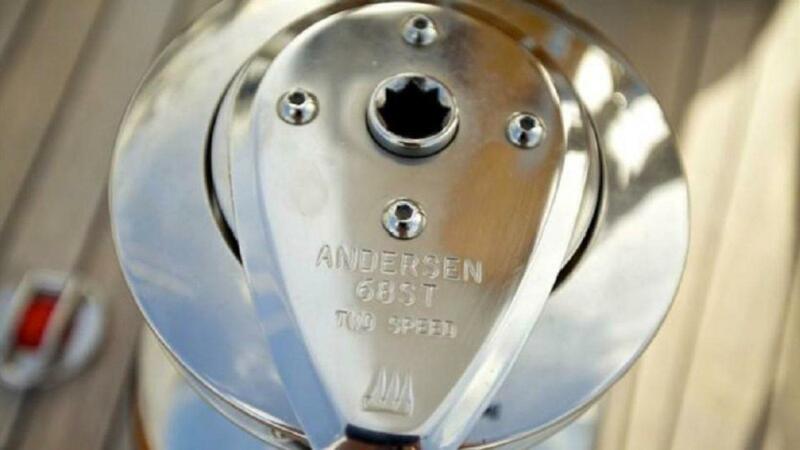 Forward of the mast is an Andersen model #68ST two­speed self tailing hydraulic windlass with two footswitches. 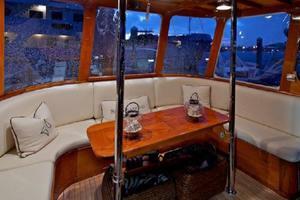 On top of the pilothouse is a Givens 8­person life raft and a stainless steel boom cradle. On the sides of the house are two decorative throw rings and two dorades. 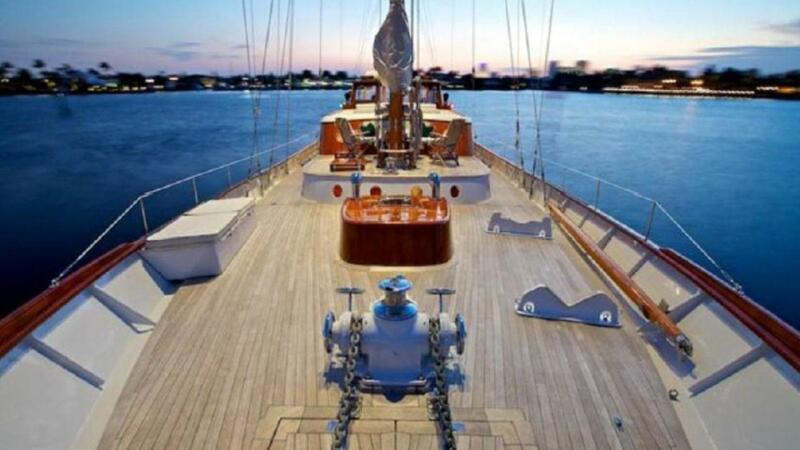 On the starboard side of the house is a hand­operated spotlight. 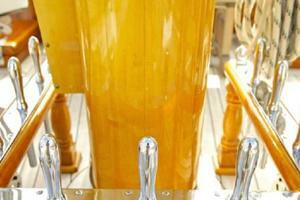 In the deck amidships are Highfield levers for the running backs. 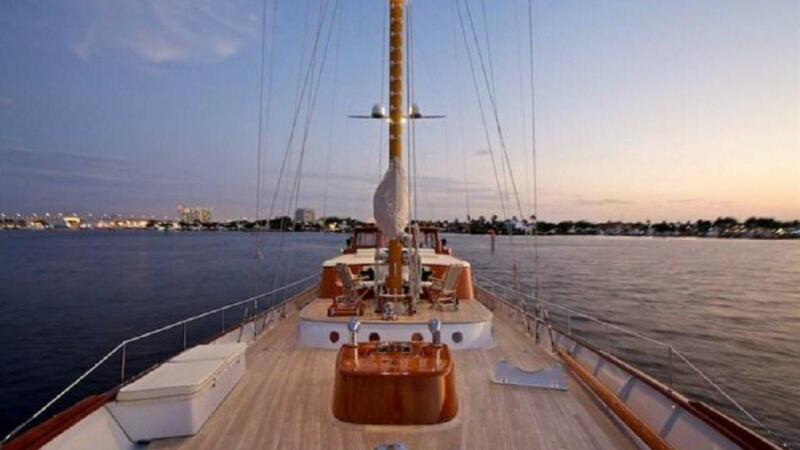 To starboard aft is a small davit for the dinghy stage. 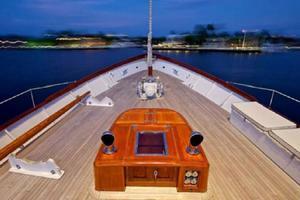 In the center of the aft deck is a warping windlass. 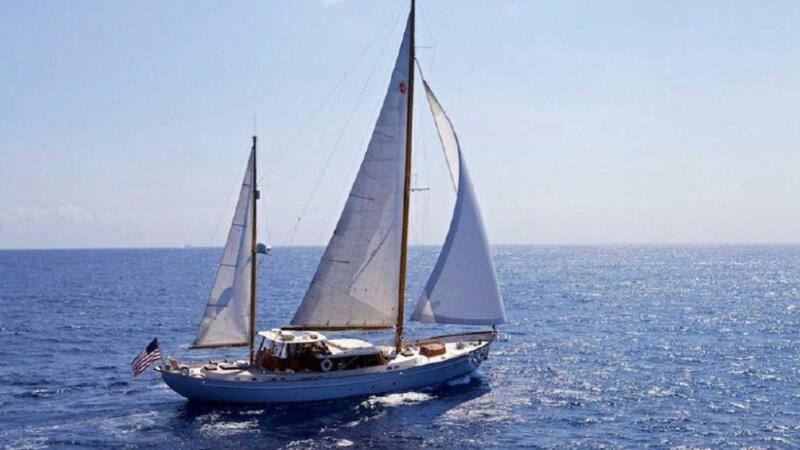 On the after housetop are two Andersen stainless steel model #7857 two­speed hydraulic winches with footswitches and a single Barient model #36 self tailing winch. 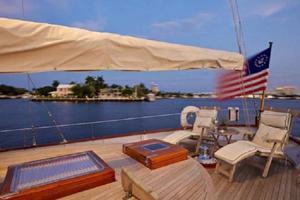 On the aft housetop are two opening deck hatches. Also mounted here is a Switlik 6­person canistered life raft with hydrostatic release. 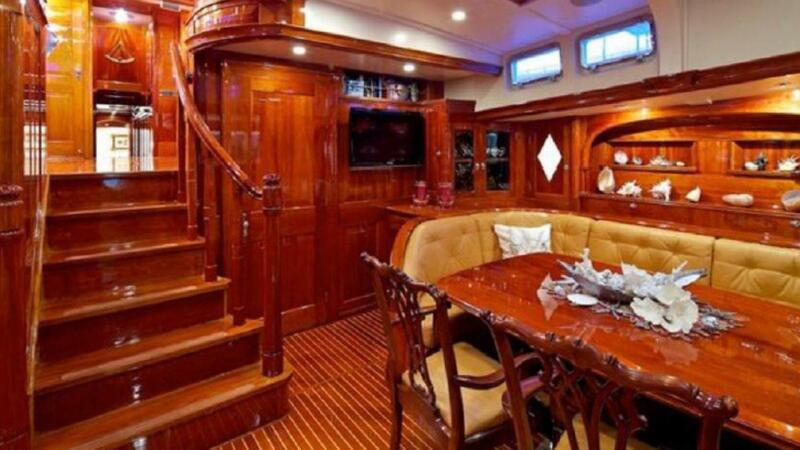 The wheelhouse is on top of the coach roof several steps up from the main deck. 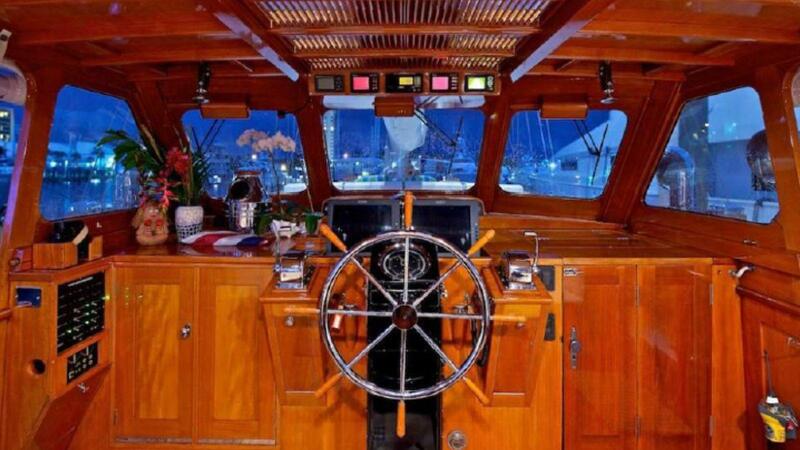 The wheelhouse is of open construction. 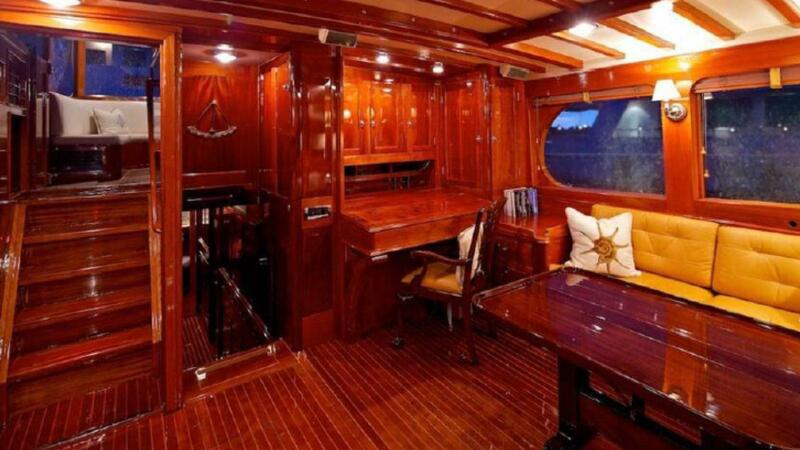 It has a glass windshield with Plexiglas and vinyl enclosure aft with half doors port and starboard. Each of the doors has a guardrail. The overhead has a large Plexiglas panel. Aft is a built­in circular lounge with table. 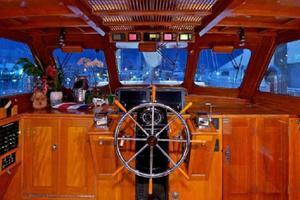 To helm is a stainless steel destroyer type wheel with teak spokes on a freestanding pedestal. The controls are single lever cable. There is safety gear stowed beneath the lounge seats. 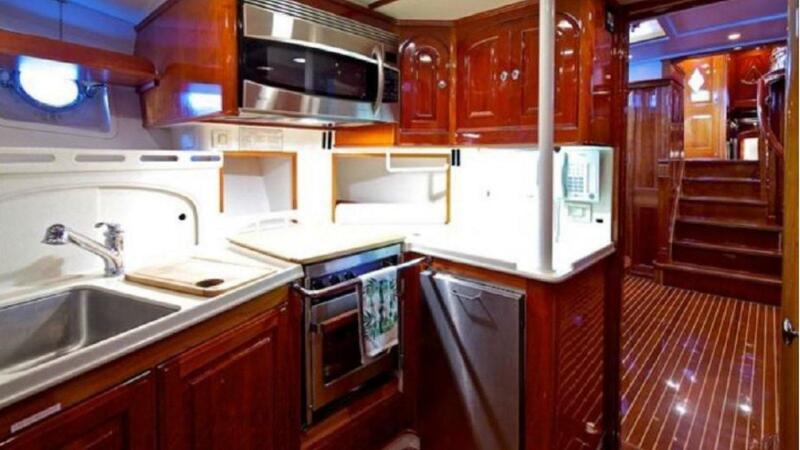 Built­in to starboard is a small refrigerator. Just above is a signal flag locker. In the cabinet port side forward is a DC circuit breaker panel fitted with voltmeters, amp meters, and rotary selector switch. 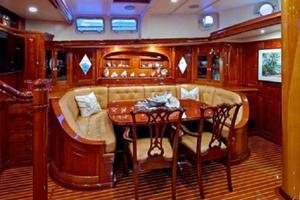 Built­in the lounge aft are two ventilation blowers for the guest and master heads. Access to the lazarette is via a hatch in the after housetop. The lazarette is well painted and lit. 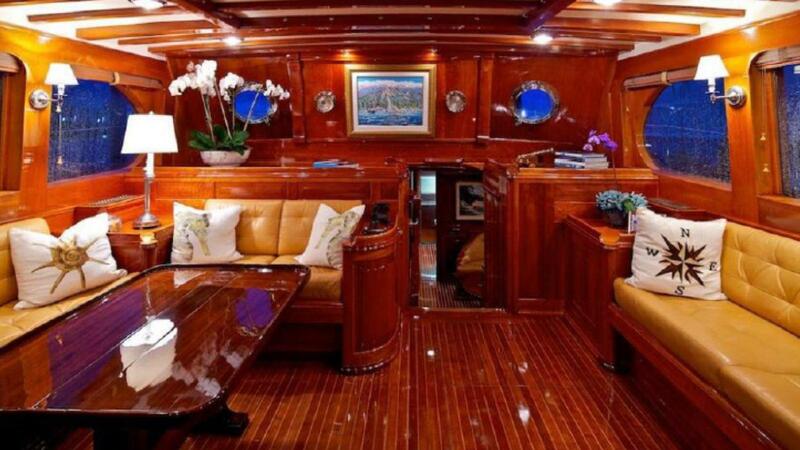 There are floorboards in the lazarette. It is used for storage. Beneath the floorboards is the steering system. It is a heavy quadrant on a heavy rudderpost with stainless steel 7 x 19 cable through welded box sheaves. Beneath the quadrant is an electro hydraulic steering pump with a single ram to the quadrant. This ram is activated through the automatic pilot. Also seen here is an emergency tiller. In addition to the general storage items seen in the lazarette is one of the original CQR anchors with chain leader. 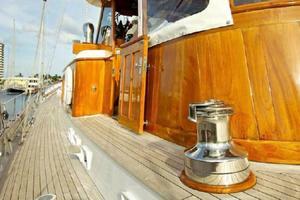 Extending down from the overhead is the aft deck warping windlass motor. 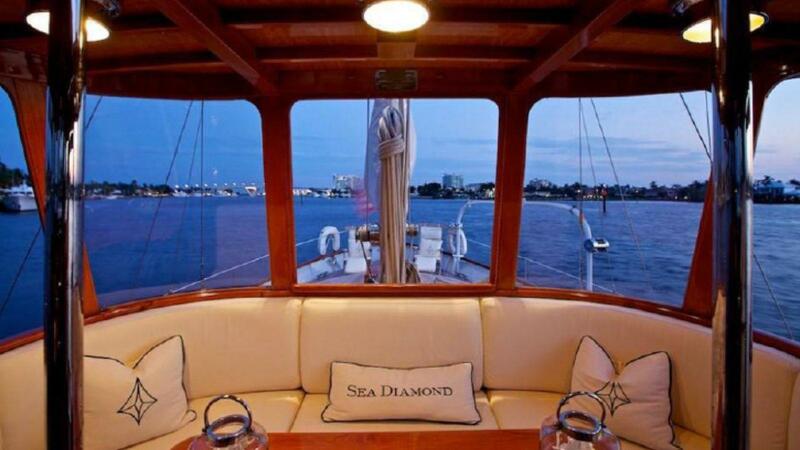 SEA DIAMOND is of all steel construction. 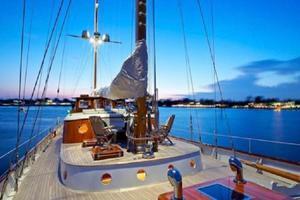 She is a full displacement, canoe stern sailing yacht design. 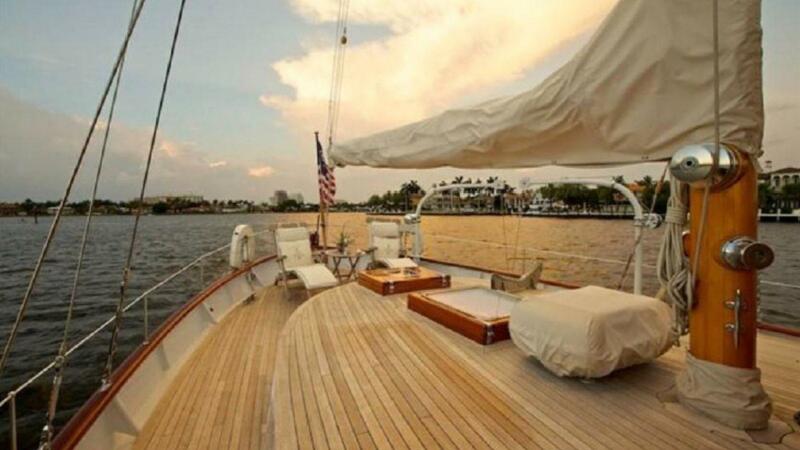 She has a centerboard offset to the port side of the keelson. 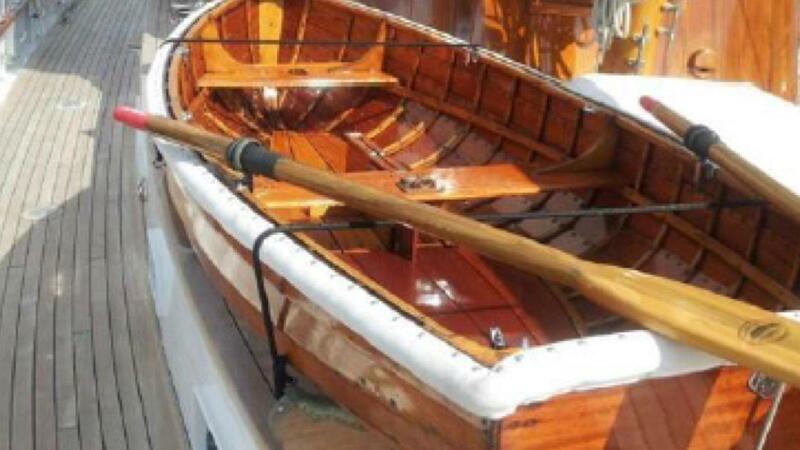 She has dual propellers and a single rudder with a canoe stern. 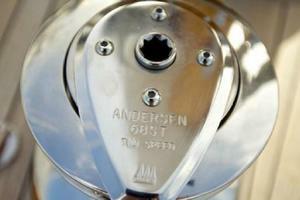 In the bow is a bolted stainless steel striker plate. 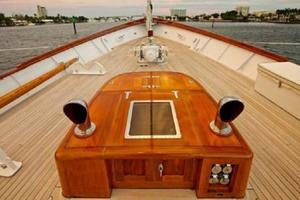 She has full length rub rails with stainless steel half oval chafe guards. Her main engine exhaust is out the horn. 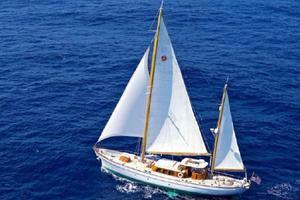 She is painted in all white with green boot stripe. 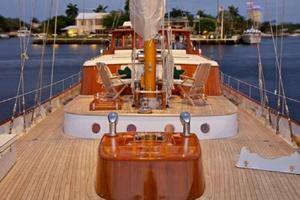 Her topsides are in good condition, painted and faired to high standards. 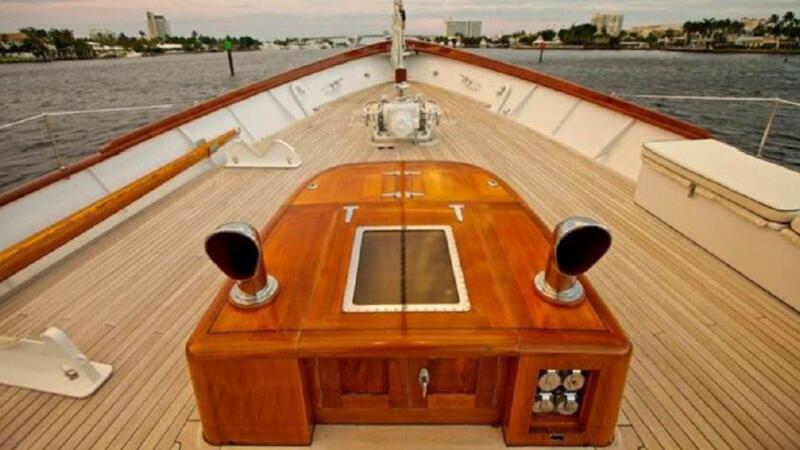 Her bow thruster is 12” in diameter with no eyebrow or relief. There are bolted horizontal grates. 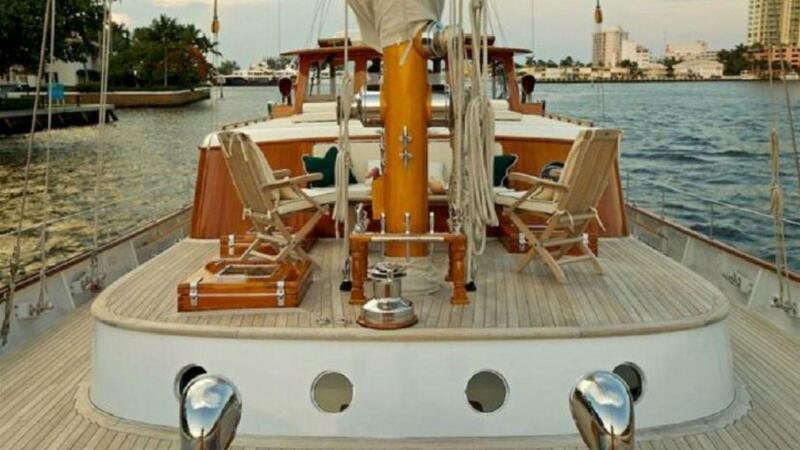 She has dual counter rotating 5­bladed bronze propellers on a bronze foot. The bow thruster is in good apparent condition. Her stabilizers are welded steel construction. They are on palms or flanges. 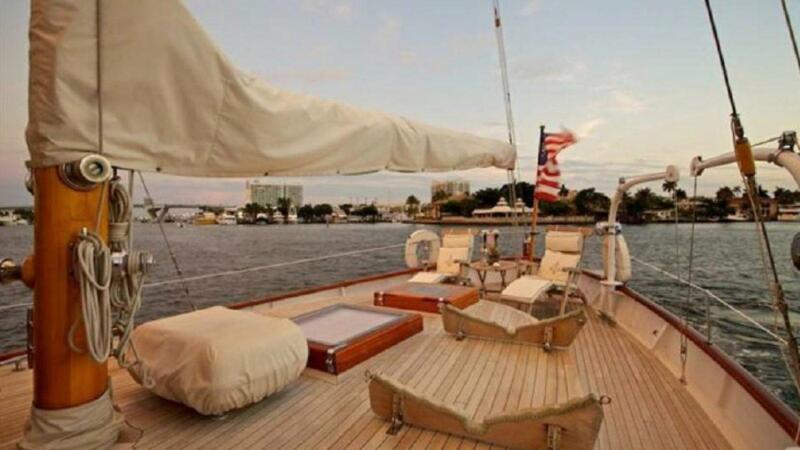 They measure approximately 38” x 56”, or approximately 15 square feet each. Her stabilizers are found to be in good condition, showing no signs of damage. 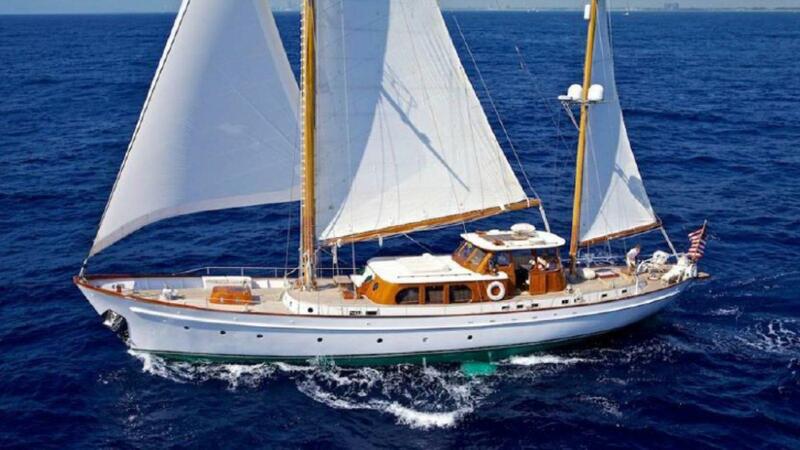 She is twin diesel engine powered. 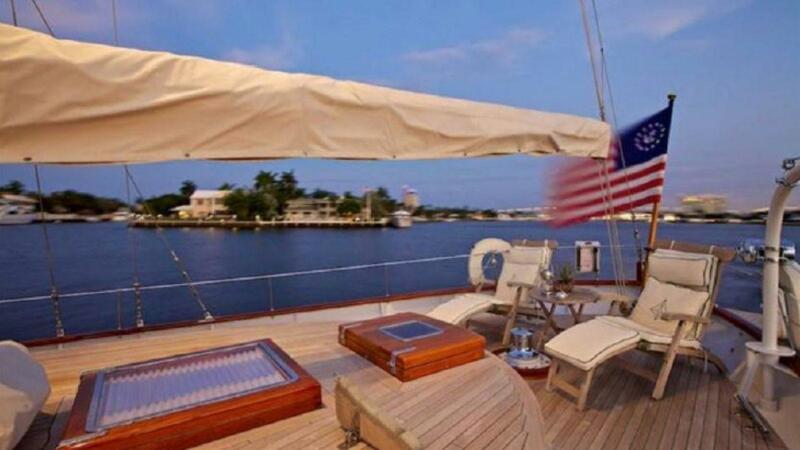 Her shafts are 21⁄4” stainless steel one­piece in bolted steel vee main struts with a bearing in each strut. 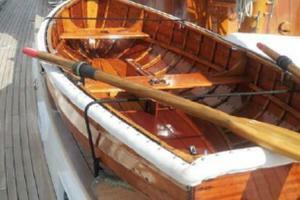 Her propellers are three­bladed bronze stamped 29.5 x 20. They are installed with cone nuts. The propellers cannot be turned by hand at this time, however, it is noted she has been hauled out for an extended period of time. Her dripless bearings are obviously dry. 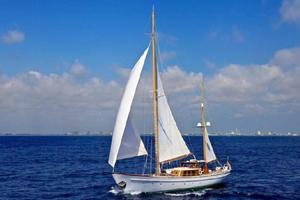 She has a single fabricated steel rudder measuring approximately 44” x 59”. The rudder is on an extended skeg. The rudder upper and lower bearings all appear to be in good condition. 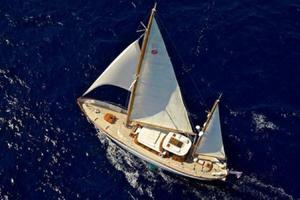 SEA DIAMOND has an all wood ketch rig. 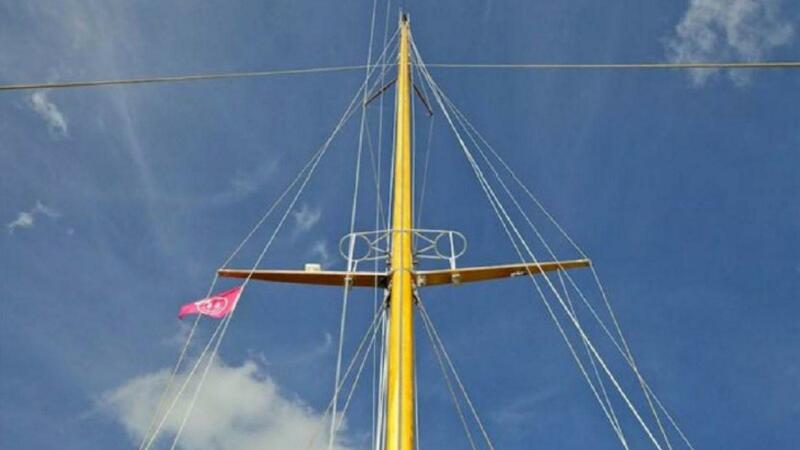 Her mainmast and mizzenmast were replaced with new in 2009. 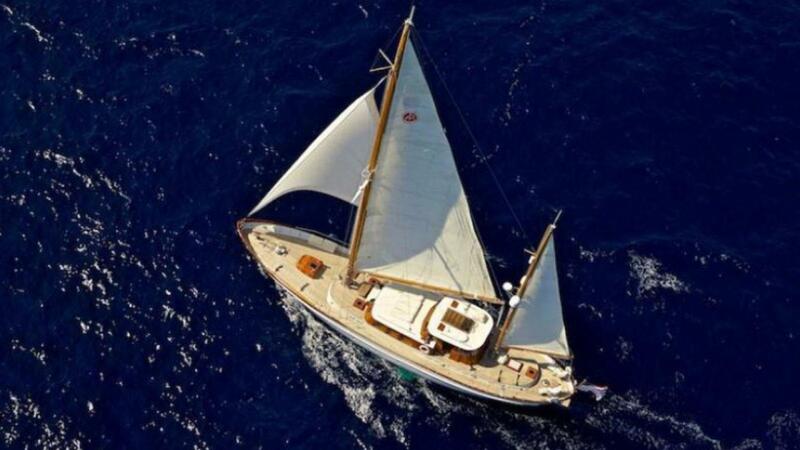 She is a 7/8 rig with single spreaders with jumper stays on the main and mizzen with a triatic between the mastheads. 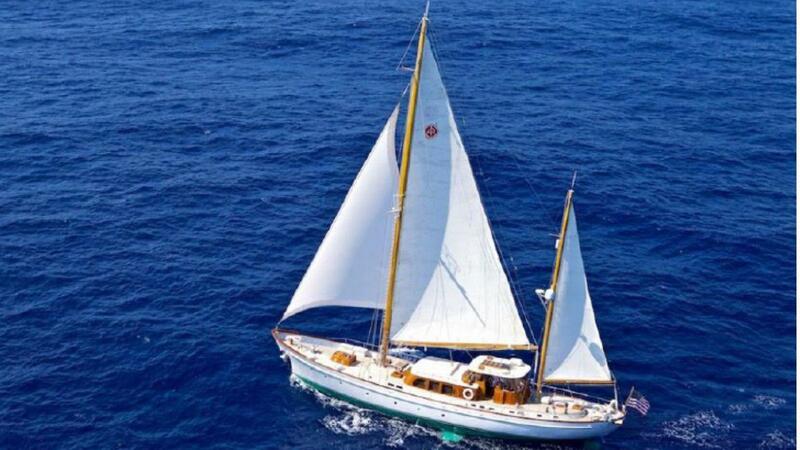 She has two lowers, a single upper, staysail, standing backs, and running backs. 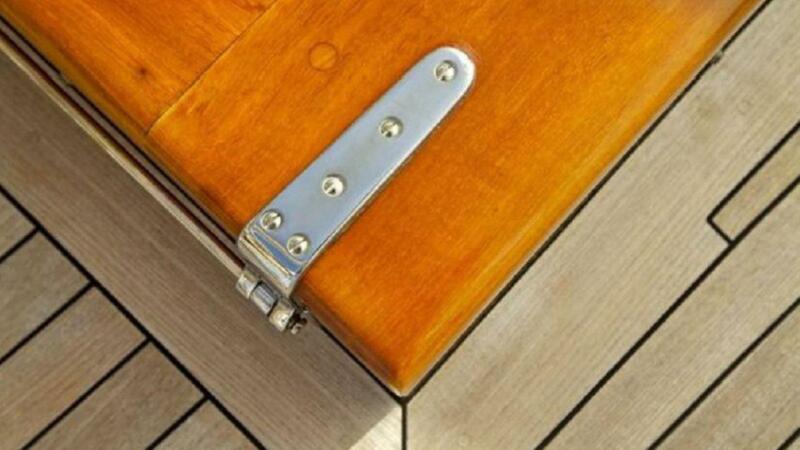 Entry into the chain locker is via a pair of heavy teak flush hatches in the foredeck. These hatches are fitted with dogs. The gutters are stainless steel. The center part of the gutter removes for access into the compartment. This area is lit and painted. The chain bin is divided with spurling pipes through the after bulkhead. Forward are the hawse pipes fitted with chain wash. Extending down from the deck forward is a Samson post. 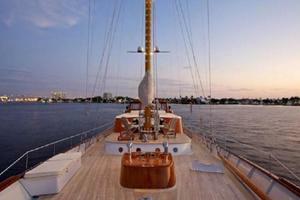 Forward down the port side is the stainless steel hydraulic plumbing for the headstay roller. The anchor bins are lined with a hard plastic material. 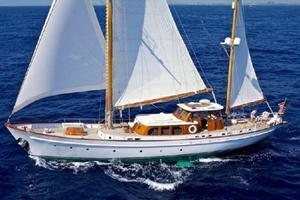 Built by Abeking & Rasmussen and designed by Philip Rhodes you couldn’t ask for a better pedigree. 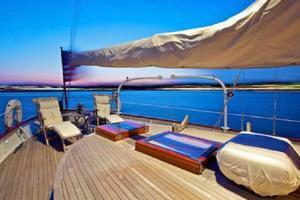 SEA DIAMOND is very well known in yachting circles around the world. 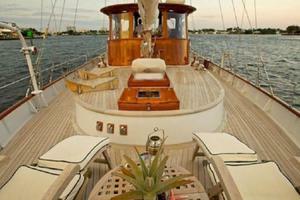 She is an exceptional vessel that has been well maintained by her very generous owners over the years. 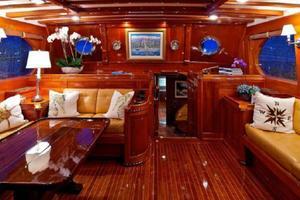 Between 2001 and 2004 SEA DIAMOND underwent a major interior and major systems refit at the cost of 6 million dollars. 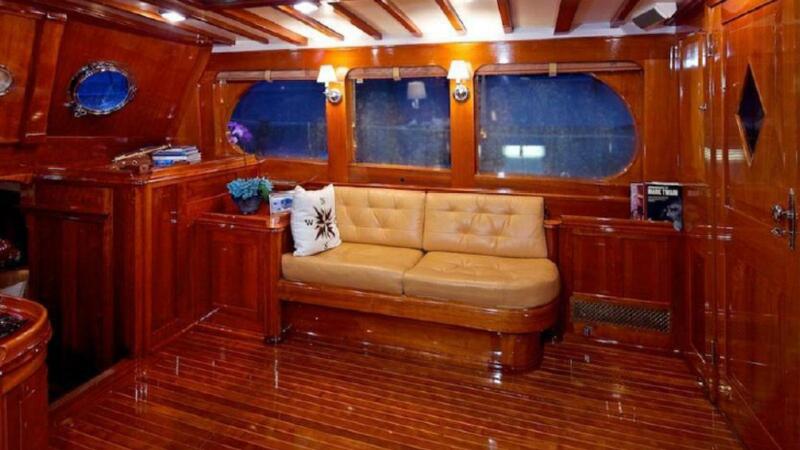 Her entire interior was completely stripped down to bare hull and a new interior was built from scratch. 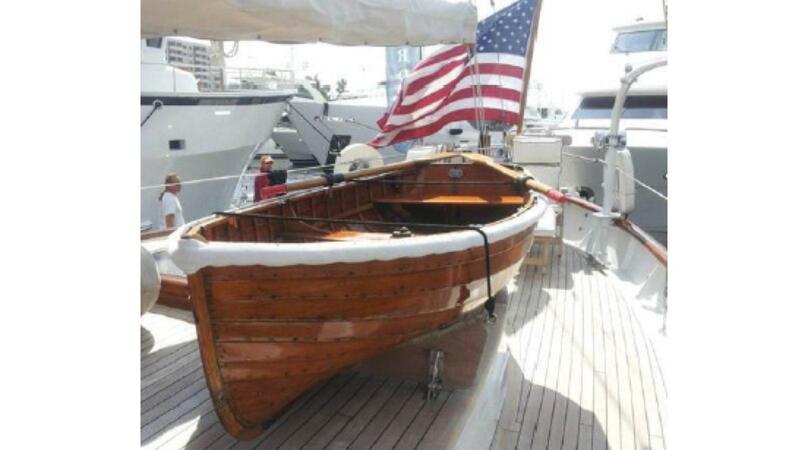 The work was performed at Fairhaven Shipyard, Fairhaven, MA over a 3 year period. 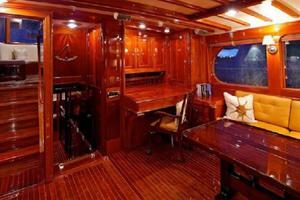 A team of craftsman with nothing but the best wood working skills was assembled for the new interior joinery work. 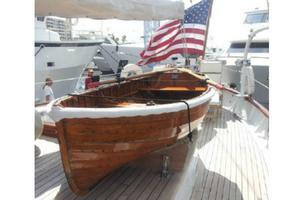 The end result was a beautiful masterpiece of wood work. 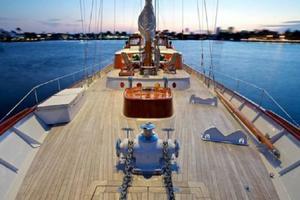 At the same time, the entire teak deck and sub­decking were replaced. 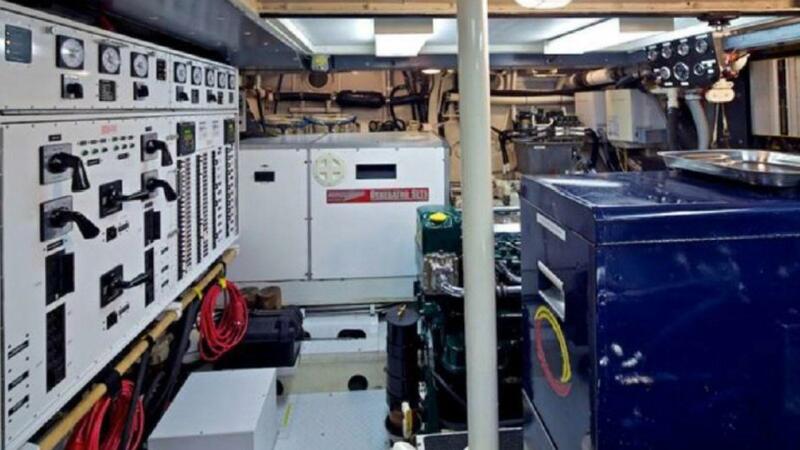 Also during this refit period, complete new AC and DC electrical systems were installed, including all new pumps, air conditioning, and galley appliances. 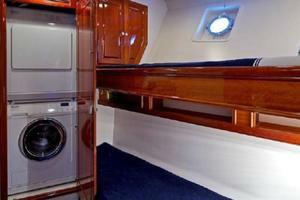 Two new 32 kw Northern Lights generators were installed just before this refit. 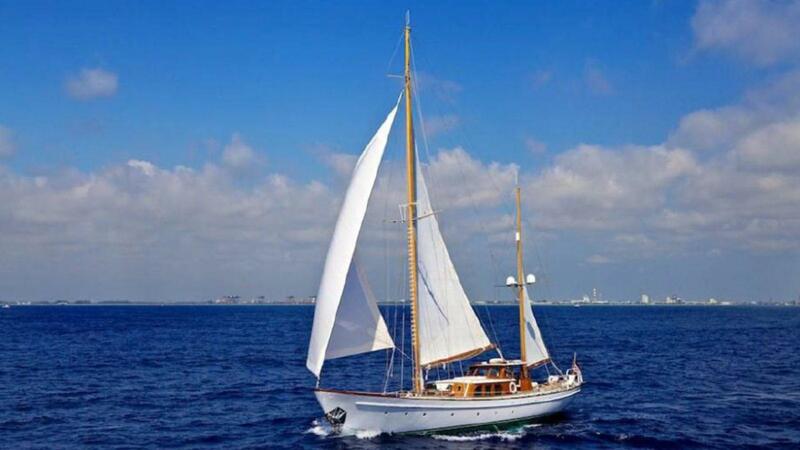 In 2009 all new Sitka Spruce masts and booms were built, along with all new custom fabricated metal mast hardware. 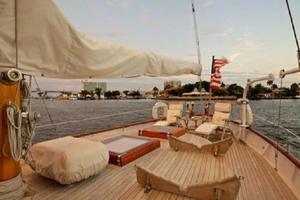 In 2010 the entire interior was redecorated with all new fabrics and soft goods. 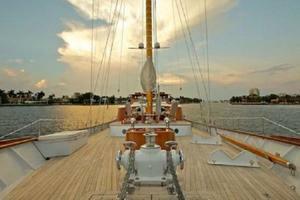 The end result was stunning for a yacht of her age, better than the day she was built! 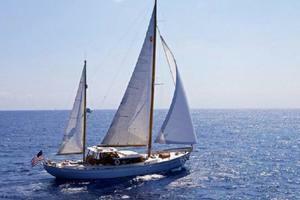 SEA DIAMOND is matchless. And although she has been reworked from a mere shell, her period piece quality has been retained. 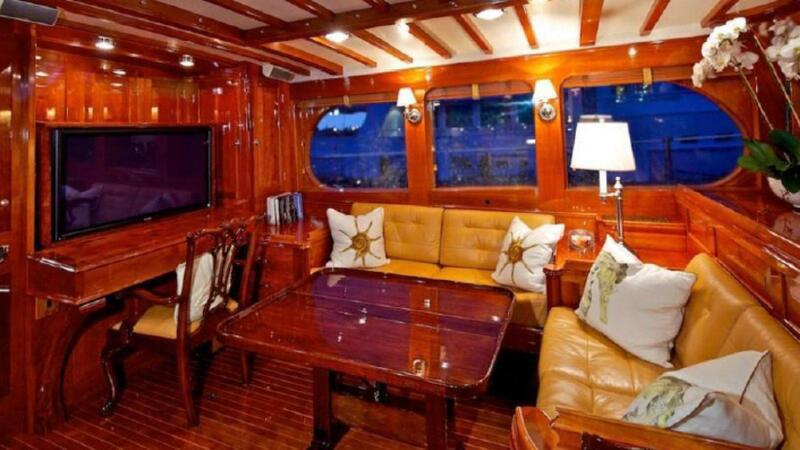 At the same time, she offers a full array of modern amenities and serves as the perfect hostess to the most discerning guest. 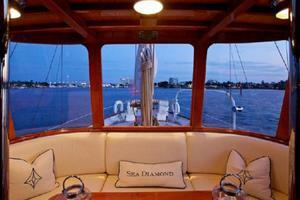 SEA DIAMOND always attracts a great deal of attention in harbors and anchorages everywhere. 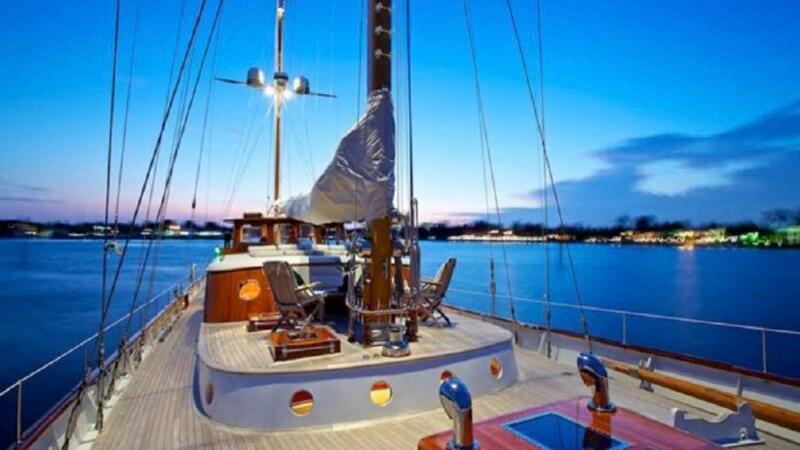 This yacht is owned by a Limited Liability Corporation (LLC) and any interested party should consult a Maritime Attorney to discuss potential tax saving benefits.